I’ve talked about the wedding of our dear friends Rocio & Earl, here if you missed it. Today I’m writing an article on the outfit details, and specially the espadrilles that I handmade but didn’t get a chance to shoot on the wedding day. I worn them for dancing and I was way too busy to stop and take photos ! It’s all about enjoying the moments. My friend Laura was kind enough to shoot with me this convertible outfit with the espadrilles and a second look. All I can say is that orange suits brunettes and blondies ! I’d seen on Pinterest that you can handmade your espadrilles and because they are Spanish originally I felt like I had to try to make my own. It’s fairly easy, you can find a video from Prym, the brand that sells the soles on Amazon, here. They are not perfect but for a first pair it’s not too bad, and they are confortable as well. 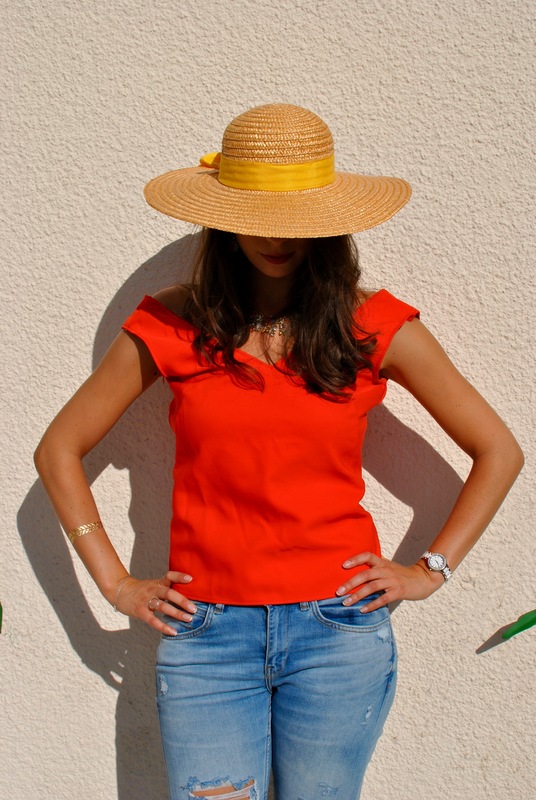 Laura wanted to wear the top of the outfit with a pair of distressed jeans and a straw hat, which would be a perfect outfit for a brunch or a picnic. Also she had this soft pink top that went perfectly with the vibrant orange of the skirt. Let me know if you like this convertible outfit and the options ! Don’t hesitate to make your own espadrilles, it’s easy and you’ll be impressed by the result, if you do, please tag me on Instagram with #madamedanielDIY I would be thrilled to see them. Je vous ai parlé du mariage de Rocio ici, et pour ceux qui sont intéressés, voici le détail de la tenue et surtout les espadrilles ! Le jour J, j’ai profité de l’instant présent, et du coup je n’ai pas de photos des espadrilles; trop occupée à danser sur Despacito toute la noche ! Une bonne excuse pour embarquer ma copine Laura qui a accepté de jouer les mannequins, et que dire, le orange va très bien aux brunettes et aux blondes ! Laura a donné un petit coup de pep au top, avec le jean destroy et le chapeau de paille, pourquoi pas pour un picnic ou un brunch ? Un bon moyen de recycler la tenue de mariage. Publié dans DIY, FashionÉtiqueté accueil, DIY wedding outfit, espadrilles, mariage rocio et earl, orange wedding, spanish wedding, wedding in spainMettre en favoris le permalien.